This month the theme is a Colour Challenge!!! We will be working with Lemon Lime Twist, Island Indigo, and Early Espresso. 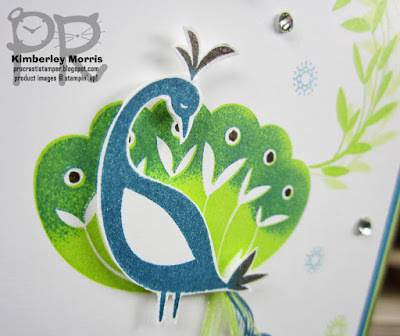 This project marks my first inking up of the FREE Sale-a-Bration stamp set, Beautiful Peacock--and it really is beautiful!!! The Beautiful Peacock stamp set features a two-step peacock as the focal point, with the body of the peacock, and the feathers, as two separate stamps. There are also several little flourish and accent images, and a couple of greetings. You'll need at least a $50 USD order to choose this set for FREE--if you'd like to make this card, check out the Stampin' Supplies listed at the bottom of the post and grab what you'll need! Now, let me share some deTAILs...lol. The picture below highlights a special peacock "tail" spray of feathers, which was created with threads frayed off from a short strip of Lemon Lime Twist Finely Woven Ribbon. I also stamped one of the stamp set flourishes on the bottom layer of the card, with an Island Indigo ink pad. I stamped it once in full strength, and then once again off to the side, for a lighter image. 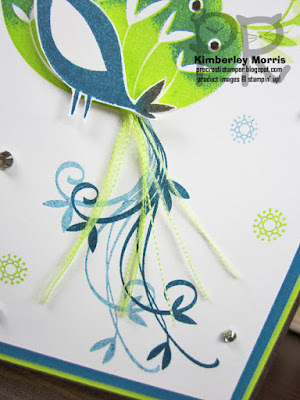 I did the same dark/light stamping with the top flourish image, but with the Lemon Lime Twist ink pad. To get the two-toned peacock body (pic below), I first inked up the body with an Island Indigo ink pad. Then, I grabbed a Sponge Dauber, tapped it into an Early Espresso ink pad, and then dabbed that color onto the ends of the head feathers and tail feathers on the image. After that, I exhaled onto the image to revitalize the inks, and stamped the body. 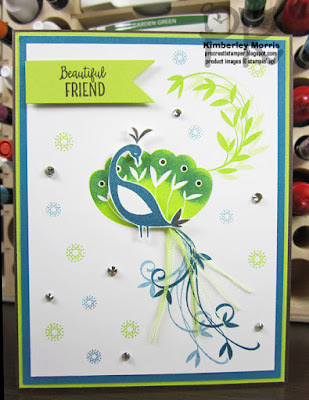 I actually stamped it on a separate scrap of Whisper White Card Stock, so I could cut it out with my Paper Snips, and pop it up using Mini Stampin' Dimensionals. For the fan of feathers behind the body, I inked up the whole image in a Lemon Lime Twist ink pad and stamped it down first. Then, I didn't clean off the image--I took a Sponge Dauber and inked it up in an Island Indigo ink pad, and dabbed that ONLY on the scalloped ends of the fan of feathers. 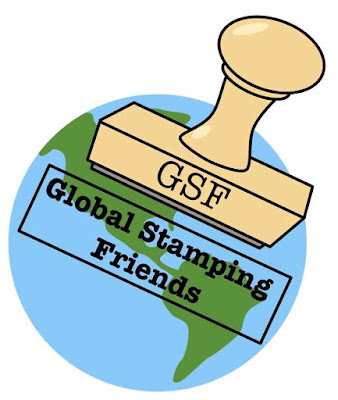 Because the stamps are photopolymer, I was able to look through the inked image to line it up right over the top of where I had already stamped. 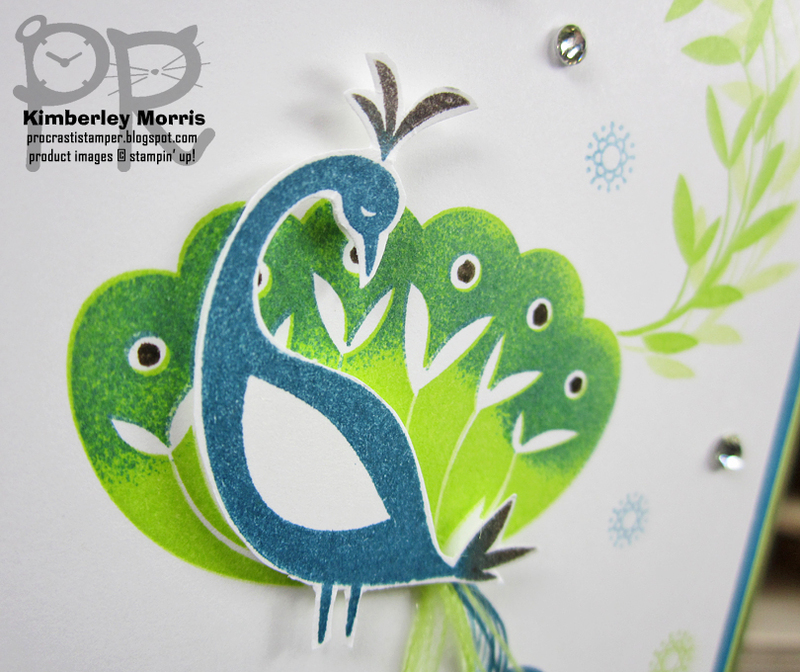 You can totally do the fan of feathers in one step like I did with the body...but I actually forgot the Island Indigo ink when I first stamped it down, so stamping over the top was a recovery move! If you look closely at the body coloring versus the fan of feathers, you can see that if you do the "overstamping" like I did in my recovery move, you actually preserve more of a speckled transition with the second color. So, it's pretty cool...will be a great Stamparatus technique! In the picture below, you can see the layers of the card. The base is Early Espresso Card Stock, then there is a layer of Lemon Lime Twist Card Stock, then a layer of Island Indigo Card Stock, and finally, the stamped layer of Whisper White Card Stock. 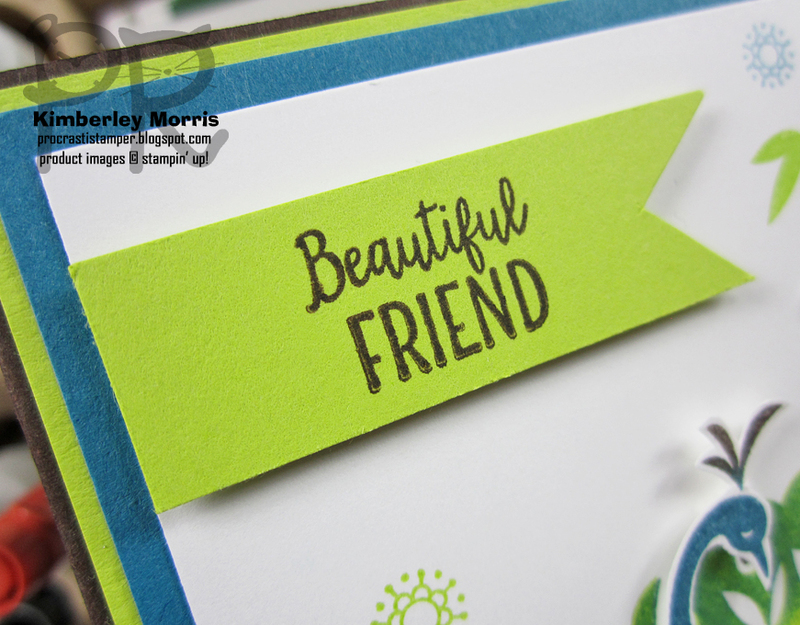 The little banner is also Lemon Lime Twist Card Stock, with the saying stamped in Early Espresso ink. I think the banner is 5/8" tall, and I just eyeballed the length. I cut the notch at one end of the banner with Paper Snips, again just eyeballing it. One final TIP: the blue background circular images were inked up on an Island Indigo ink pad, then stamped off onto scratch paper (Grid Paper) before stamping onto the card. This makes them lighter, so they don't compete with the focal point for attention. Stampin' Supplies: Beautiful Peacock FREE Sale-a-Bration stamp set, Whisper White card stock, Lemon Lime Twist card stock & ink, Island Indigo card stock & ink, Early Espresso card stock & ink, Sponge Daubers, Lemon Lime Twist Finely Woven Ribbon, Basic Rhinestones, Mini Stampin' Dimensionals, SNAIL Adhesive, Paper Snips, Stampin' Trimmer (to cut and score card stock), Grid Paper. Click the Next arrow below to see Marieke's marvelous creations! 14. Kimberley Anne Morris YOU ARE HERE! WOW just wow the colouring is amazing!! Love it! The colour blending on the main tail is great. Thank you for taking part. Great card! I love how you hid the start of the ribbon. Oh wow, This is Awesome Kimberley! Your blending was perfect. Absolutely beautiful - I need to ink up this set! Gorgeous. Love the close up photos too as they give a real feel for this wonderful card. Fantastic card, love all the little details you've included!